I'm not gonna repair the rust holes man!! lol I'm gonna run this body off the frame and wheel the live crap out of it!!! The rust is the least of my worries my friend!! Oh no I know exactly what you mean man!!!! bel air? why not. lol. With out trying to offend anybody, because everybody has their own idea of what cool. and in many cases what one person think is nice the other person won't like at all. 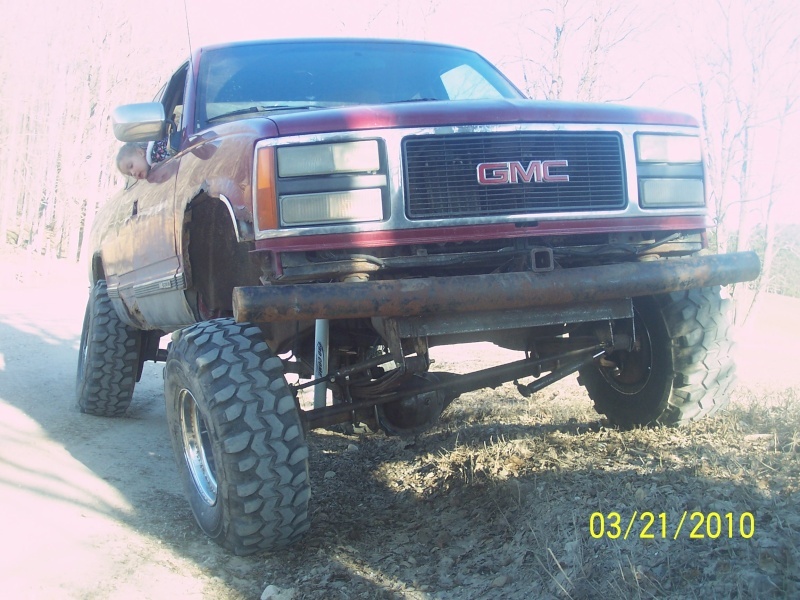 Personally, I don't like the idea of a car on a truck 4X4 chassis. I agree Trux. 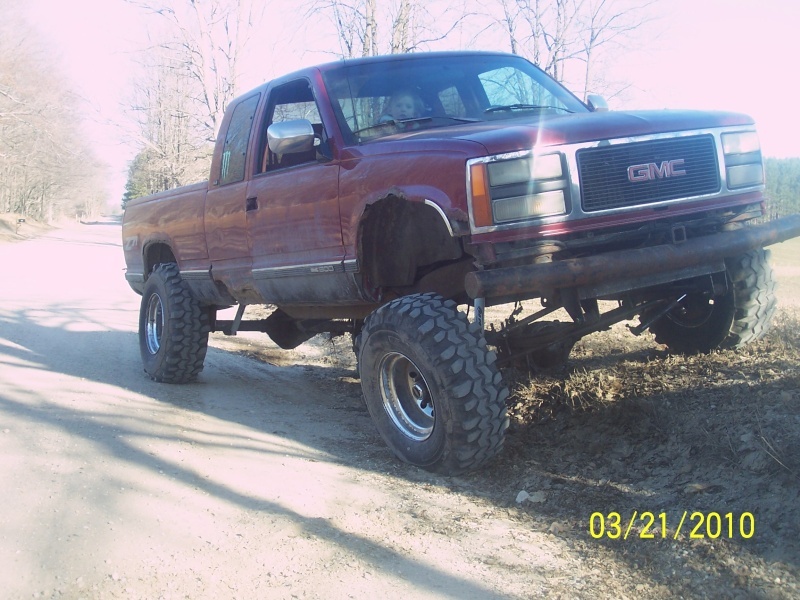 I am quite the redneck I chew tobacco and where my CAT hats and where boots but I don't like the look of cars on a truck frame either. 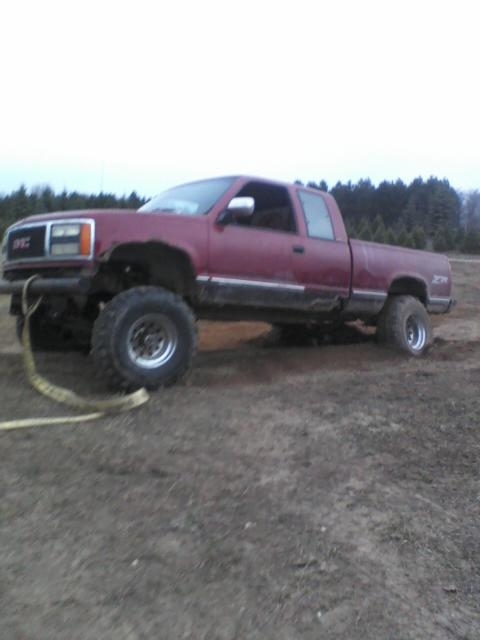 And I agree about the truck looking tuff now comaped to it's stock form! And as my all time favorite saying goes... "REAL 4X4'S ARE BUILT NOT BOUGHT!" I agree Trux And as my all time favorite saying goes... "REAL 4X4'S ARE BUILT NOT BOUGHT!" My sediments exactly, that's an awesome saying I like it. Looks great fasel! That should be one heck of a mud buggy! Thank you very much semo! I appreciate all the comments guys it make me feel really good about the work that I've done... But something that makes me feel even better about the work that I've done is being able to do something with it! And like I said before I was gonna try to get some action shots for you guys this weekend. Well I got a couple shots but I'm gonna say rite now that they are nothing xtreme! 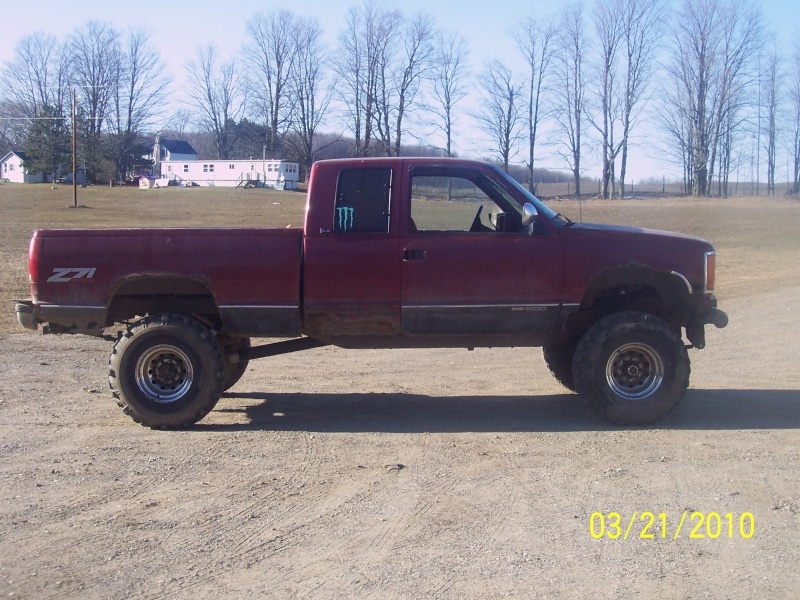 Here is my truck broadside! 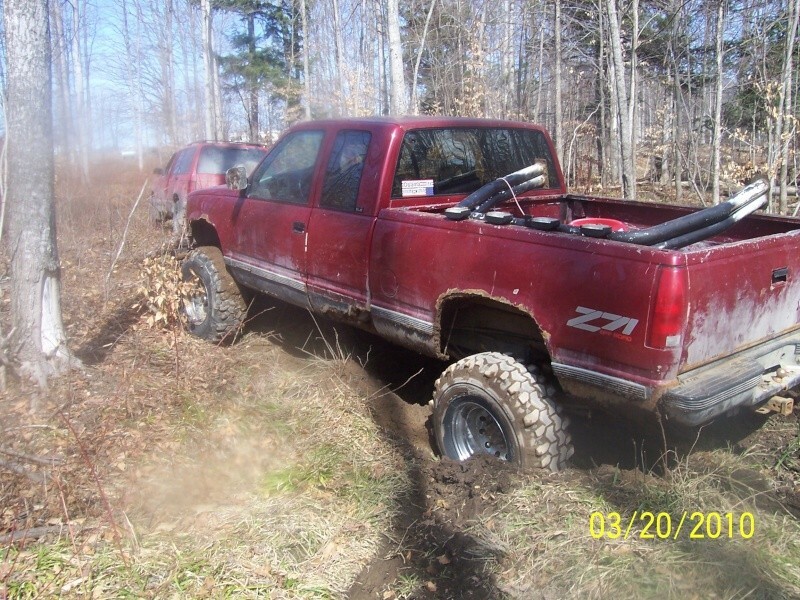 In these 2 shots I was playing out in the woods on the back of our property and found a set of trenches that matched my wheelbase alittle to perfectly and without 4x4 I was stuck but it was a ton of fun though!!! Very Cool !!! Nice shots. Looks great. Thanks guys! 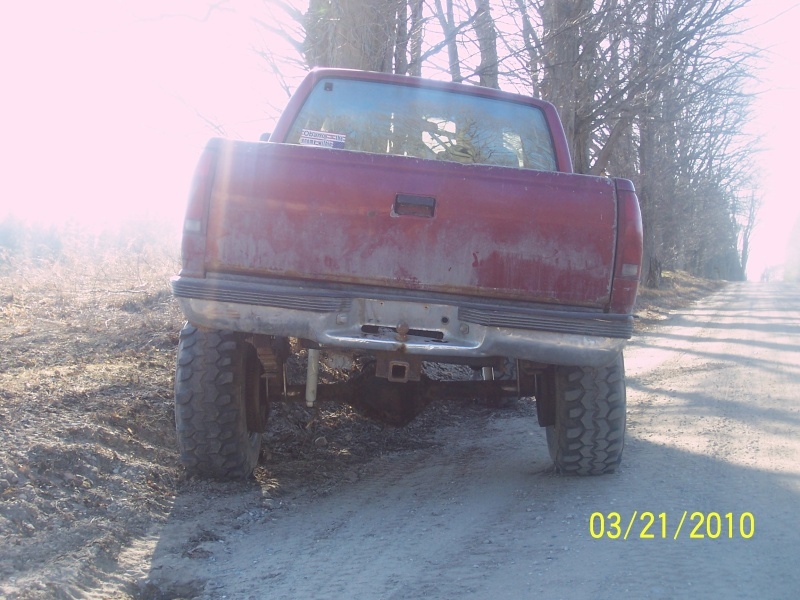 I plan to do some more work with the truck though because as you can tell in the broadside photo the front axle actually needs to be mover forward about an inch or two... It rubs when I flex with the wheels turned. My thoughts exactly... But I'm kinda unfamiliar with off set leafs... Is it a whole set of can I just fashoin myself a hole in the mainleaf of the springs I have? Will it work the same way or are offsets something specail? they are special to my knowledge.. the main is the same but the locator pin and other leafs are moved forward or back depending on how you mount them.. rancho makes a really nice set for jeeps that most guys use on everything.. just gotta see what your spring length and width is and go from there. A set of rear springs from a 80-87 fabbed on the front is a pretty easy swap. It will move the axle forward a couple inches. Already thought of that semo... And I already used a set of 52" rears from an 85 but it's still not foward enough so I thought maybe I put them on backwards not noticing but no they are installed correctly... I'm thinking I may need to get a set of spring from a dodge dakota the only problem there is they are 56" and I'm using 52" so I'd have to make them fit and they have a 10" offset so that would be alittle much I think. Ok so update!! 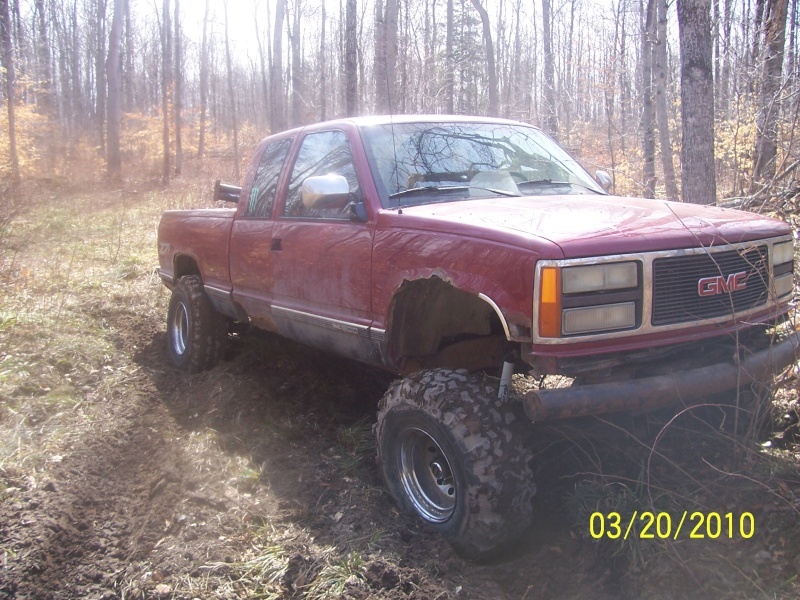 I found a set of spring that'll work for my truck!! The are 50 inch spring and they are offset 26 inches one way and 24 inches the other so now all I have to do is buy 6 leaf spring bushings and install them on my truck!! Also something I've decided is I'm gonna use this thread as my build thread but double it as my wheeling thread as well so now you can see my truck in the build process but also in the action process!! So anyway on with the pics!! 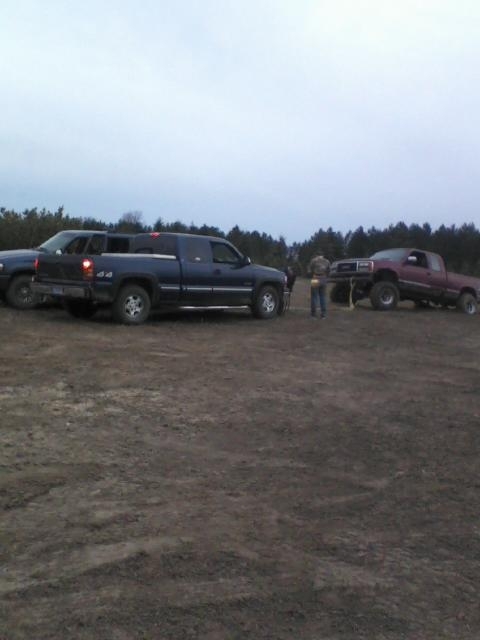 But just because I had the biggest truck didn't mean I wasn't gonna get stuck! 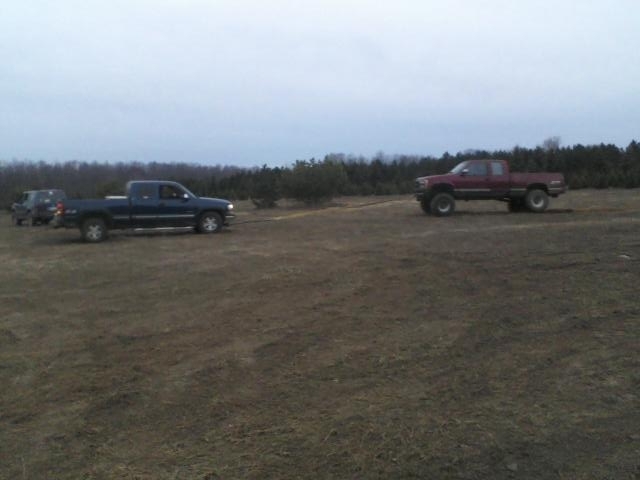 My friend Rob had to be the first to hook up to my truck because he had to try to pull my GM out with his Ford! 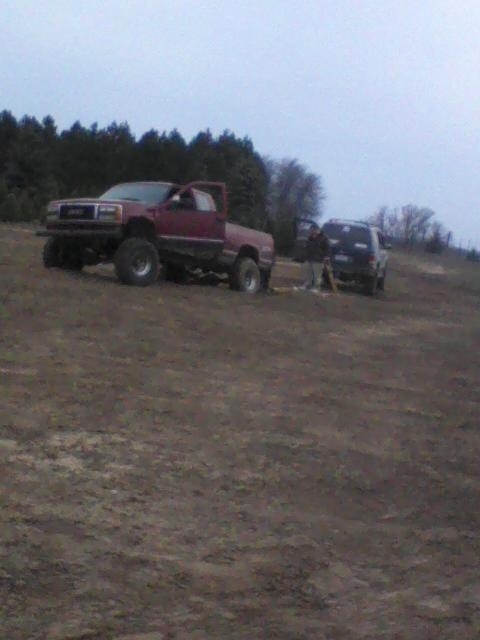 So it came down to having a Chevy pull me out!! Never send a Ford to do a Chevies job!! Enjoy the pics!! I'll have some more so because thrusday I'm going to a mud bog and this friday my truck is going to twisted trails offroad park for the first time since the SAS!!!! So I'll have lots of pics stay tuned!! 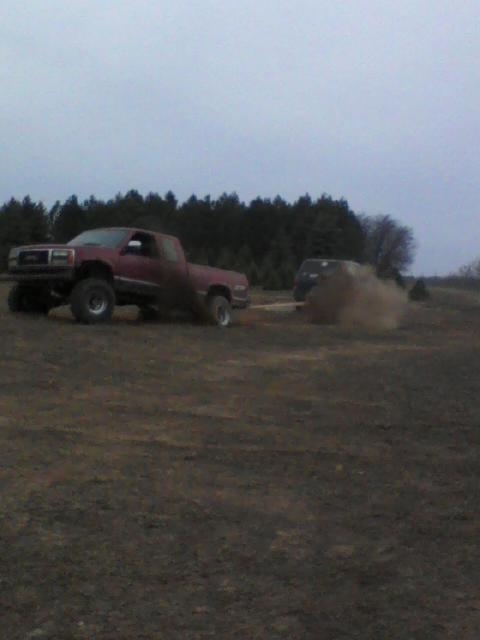 wish i lived a little closer cause i wanna go wheelin so bad..